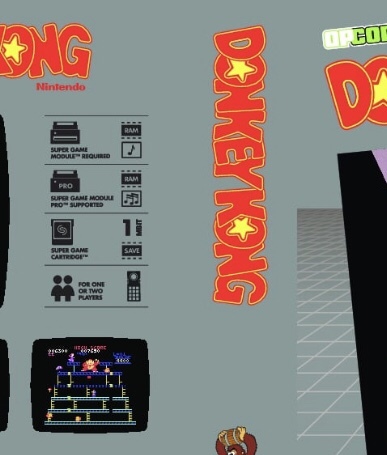 Is Opcode EVER going to release Donkey Kong Arcade? interested to know in what way, e-shop version is arcade perfect? Have you played the Switch version of Donkey Kong? I would like to buy it, but I am worried it might not be arcade perfect. Yes, I bought it. It is under their "arcade"series, not the NES version, and while I don't pretend to be an expert I would say it is exact to the arcade IMO and includes several versions of the game. Thank you for responding! Looks like I will be playing Donkey Kong this evening. You are most welcome, enjoy! Let us know what you think. The fact that the last discussion of a game that's been in development for over eight years was over four months ago says it all: the true answer to this poll is "NEVER!" Is Opcode even around? I sent him a PM a few days ago and never got an answer. It's not a big deal but it's curious. Maybe he's on vacation or something. I would have to agree.It seems he always says coming soon. It "had" to be out over 3 years ago as he said. It is basically 2019 now. Go buy a switch and get the true arcade version for a few dollars. I don't think he personally handles communication for his company. I could be wrong. Did you try the official website? Edited by Gemintronic, Sun Nov 18, 2018 3:24 PM. I don't think he personally handles communication for his company. Did you try the official website? Nope just a PM here. I'll try the website thanks. Yes, I am still around. Same for the trolls that hate me but for some reason waste their time watching this forum 24/7. No problem. I don't fall into that category, it was just a simple question about Bosconian but it's fine. I didn’t mean you, sorry if it sounded like that. It is someone else. Someone who only shows up here when he has the chance to say something negative. It is someone else. Someone who only shows up here when he has the chance to say something negative. Referring to me? Look, I only check in on this forum once every few months, not like I'm constantly antagonizing you (referring to the people you mention who "waste their time watching this forum 24/7"). I'm not even getting this at this point due to how horribly this has been handled, but this is a terrible way to run a business. I don't intend any disrespect to you personally, as you're clearly a skilled programmer who's released other great games, but a proper business does not keep getting distracted by other projects when they promised to release something else first. I feel the frustration of those who pledged their money to you only to have this delayed so long and having to wait months for refunds. You said in 2010 this'd be ready for beta testing by the end of the year. What year do you think it is? Also, the page of the game itself says what's depicted in the first image, and your main page says the second image's depictions regarding it. Edited by arcade124, Sun Nov 18, 2018 5:00 PM. Sigh..... not you either. I guess i should always mention people by name. As for refund, I will be happy to provide for those 20 or so who didn’t receive those yet, as in fact i have done on request. Most people (75%) received their refunds just a few days after preordering. As for getting distracted by other projects, does that include a pesky troll we had to fight for over an year, a trademark owner who likes to twist arms when he doesn’t get what he wants and forced us to throw away hundreds and hundreds of printed boxes using his precious Trademarked logo, and other confrontational people we need to deal with (sparing names and details)? So let’s say that I was more motivated 3 years ago. You aren’t forced to buy anything from me, and in fact I don’t think you are even in my preorder list. Hope you are happier now. Btw, DK status has been discussed some other thread. Waiting for our new custom sound chip to get ready so we can release the SGM Pro. Glad I'm not 'in your shoes'! Gads - I would have quit years ago! "Thank You" for the SGM and game releases - keep up the GREAT work. I know that DK will come out - when it is ready and done. Just rerelease Gradius sometime and I'll be happy. I know the trademark issues were rough and it was ridiculous that they made you endure that. 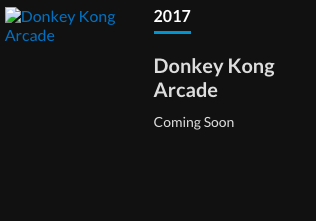 But that was years after you planned to release DK Arcade. The other projects I'm referring to are things like Gradius, Bosconian, and all the other games you came up with after DK that were released before. If the SGM situation is correctly listed, will DKA support both sound chips used in the SGM and SGM Pro? Guess I'll have to have a looksee at the other threads that i haven't read with new messages. In fact, boxes for DK and PM DX were printed with the SGM PRO support logo on it. We felt behind schedule with everything during the year, so we decided not to release Pro in 2016. Around the end of that year the idea for the new console come back, but we were still going to release the Pro later in 2017, so I had time to finish DKA and PM DX to release with it. Then Cardillo struck. In the process I lost a lot of investment, including 300 Pro boxes that had been printed with the CV logo. I will be honest with you, the whole Cardillo thing took a toll on me. Really lost the drive for anything for a while. So we floated between an Intellivision module, a new Coleco compatible console. With the new console and considering the Pro high costs because of the way we were doing it, it seemed logical to cancel the pro and go with the console. Until we got into a race. In the meantime I am delaying and delaying DKA and PM DX, waiting for the sound solution. Then, earlier this year, the exact week we had the Intellivision module up and running, Intellivision announces they were planning a new console. So now we had two active trademark owners on both CV and Intellivision fronts and that is when I took the courage to make the decision to go with my own console. And just recently the Phoenix made it clear there is no space for two CV compatible consoles (considering the costs and investment involved), so I don’t regret the decision. DKA and PM DX are still on hold waiting though, so we resumed work on the Pro, the old original Pro, until something happened after RWX in September. The interest for OMNI was clearly there, and well, it isn’t everyday you get to work with Ted Mayer, Ed Averett, Rob Fulop and others, so we thought that OMNI deserved more. Gone was the off the shelf chipset, replaced by a custom chipset. It happens that the OMNI sound chip, the omnivox, is perfect for the Pro, and less expensive than the off the shelf solution we had before. So we now can have the Pro at about the same price as the regular SGM. There you have it, the full story. And yes, DKA and PM DX and Gradius DX will all work just fine with the regular SGM but will offer much improved sound with the Pro. This was never shown because we wanted it as a surprise, but here is a screenshot of the DK boxes we had printed back in 2016. And that is how things work in home brew world. Yeah, it's definetely been a trying couple years for you especially considering the whole Cardillo hoopla. No one needs to deal with the BS, any of it, when this is a hobby and an investment of ones own time and money. Anyway, glad to hear (pun) the SGM Pro is back on and a decisiin re. the prometheus Lite was made for you due to the Phoenix without further expense to you. Edited by NIAD, Mon Nov 19, 2018 5:43 PM. I think this is a great idea, I never had an intellivision and never had any interest in getting one. 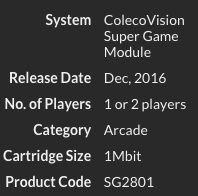 But if I could hook one up to my colecovision I would buy one in a heart beat and I'm sure a lot of other people here would too. And any other module or add on that you could come up with. Ok, here is something. Hope it is a reasonable solution for everybody. Let’s wait another 6 months and if things with the Pro aren’t clearly sorted out by then (I.e. we have a clear timeline for the OMNIvox sound chip) then I will go ahead and release DKA as it is. Does that sound reasonable?